Ada Township is a civil township in Kent County with a population of 9,882 reported by the census of 2000. With that census the per square mile population density computed to 273.9 per square mile. With easy access to M-21 it is a great location to commute the 12-miles west to Grand Rapids. The Grand and Thornapple Rivers provide amble opportunities for water sports of every type along with hiking/biking trails. Ada Township’s Master Plan calls for preservation of the rural atmosphere while offering a wide range of Parks, Recreation Areas and Cultural Centers. 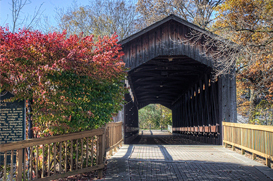 An example of this is the preservation of one of the nine covered bridges in the state, the Ada Covered Bridge. A model suburban community dedicated to the goal of providing the perfect balance between work, recreational pursuits and family for the best quality of life. Grand Rapids Magazine ranked Forest Hills Schools of Ada as number ONE in Kent County, for the second year in a row. It is no wonder why the 80% of the 1,357 students from Forest Hills Central High School will obtain at least a master’s degree. Forest Hills Northern High School takes pride in their diverse student population and gives every student their chance to succeed in academics and beyond. The school districts began experiencing noticeable growth in the 1950s with Central and Northern; however they managed with the two schools by expanding them little by little. By 2002 the growth was too much and to accommodate the students Forest Hills Eastern Middle and High Schools were built in 2004, located on Pettis Ave., opening its doors to 584 eager students. The population of students is beginning to level off to be 880.